Wooden toys are best for kids than plastic and metal toys, we are not opposing plastic and metal toys but there are environmental and child health factors like eco-friendly, durability, safety, memories that promote wooden toys. Few established wooden brands make using wood for toys from own tree farms and this is recursion process of wood generation in own farms. While plastic harms the environment, metal available but resources are limited. The wooden toys are healthier and cheaper than plastic and metal toys for the child. Sometimes quality wood makes toys costly due to good finishing on toys for the child safety reason. Hape is a well-known and trusted a brand for their innovative, safe and quality material products. 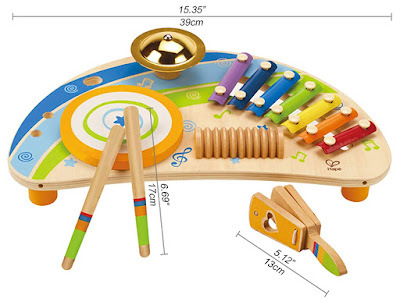 The kit includes a drum, xylophone, cymbal, guiro, clapper, and 2 drumsticks. The overlay of the miniband has screen-printed to easily clean and that maintain the vibrant sound of all instruments. The children of age 2-5 years old make fun music on the Hape Mighty Mini Band, it encourages imagination and creativity. The toolkit comes with 24 wooden pieces ( including tools, nails, screw, nuts, and bolts). This classic building set gives children all they need to tinker and build, offer hours of creative and constructive fun. Preschoolers will love using hammer and screwdriver to build their projects. 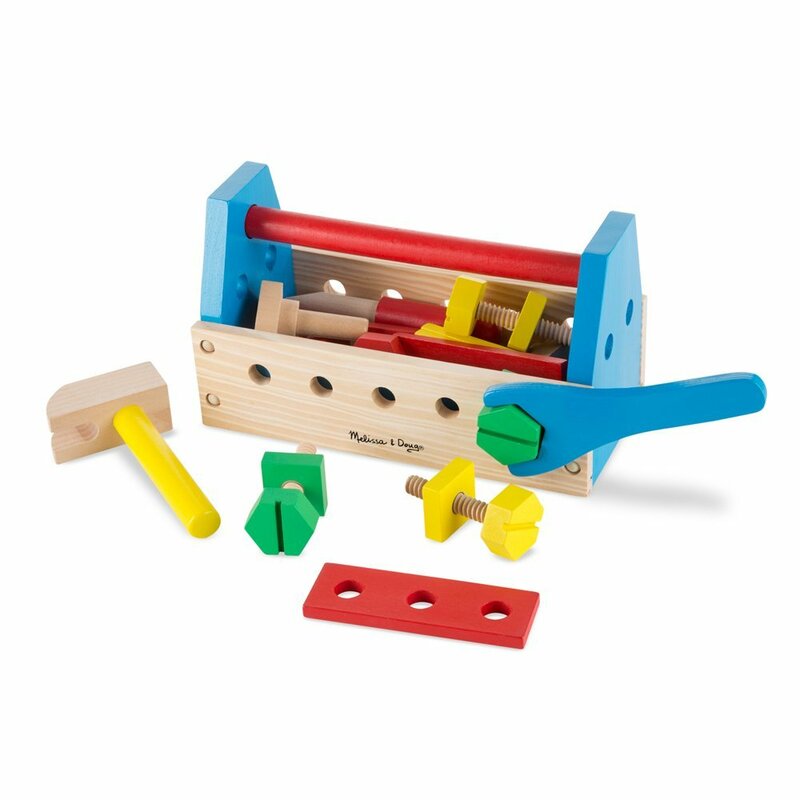 All the pieces stored in a sturdy wooden toolbox with a handle, making it great for young builders. Recommended minimum age 3 years old. 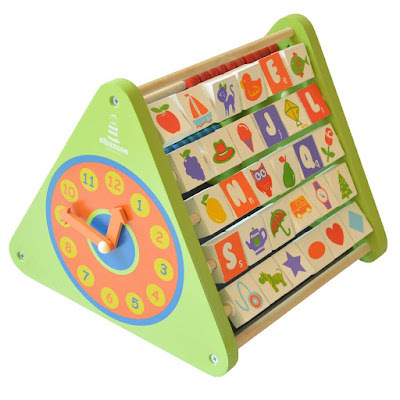 Promotes hand-eye coordination, counting, sorting, colour recognition, problem-solving skills. 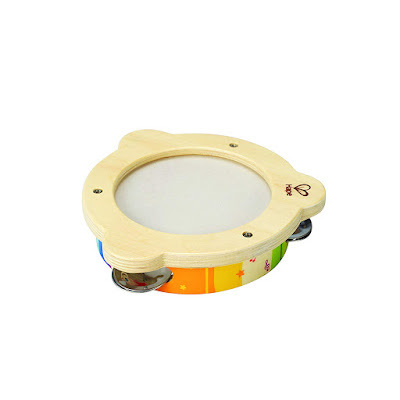 The best musical toy for kids at an early age, they enjoy shaking this delightful percussion toy. The toy is made from bright non-toxic colour and child-safe material. Beautiful design encourages child creativity and rhythmic skills. 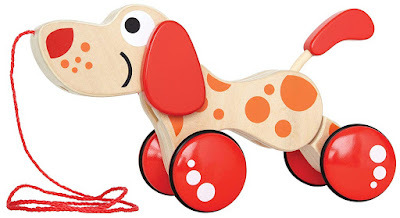 This toy is well-designed, made of premium wood and child safe non-toxic materials. 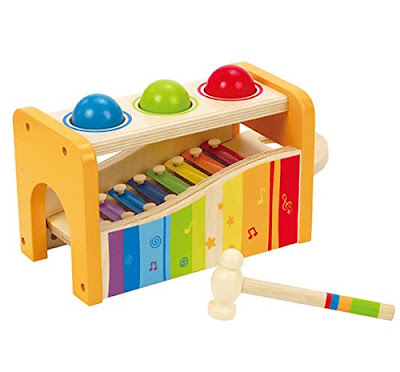 This includes a hammer with 3 colourful balls and a xylophone that can be slide-out. 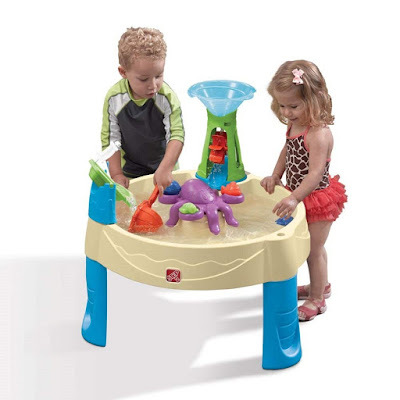 Encourages hand-eye and ear coordination. Helps in exploring rhythms and melodies. Suitable for 1 to 3 years old kid. 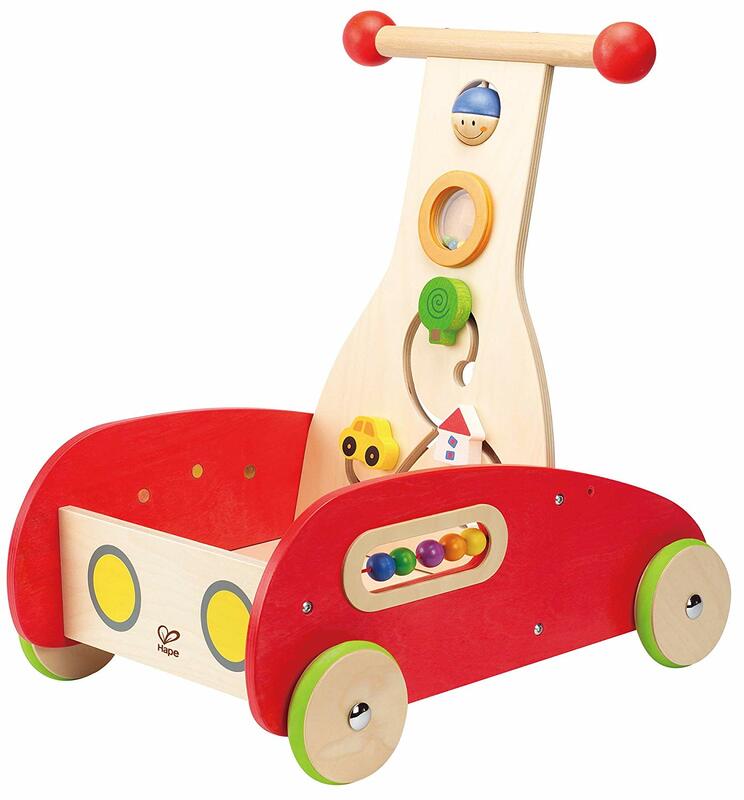 This toy well designed made of premium wood finished with child safe and non-toxic materials. 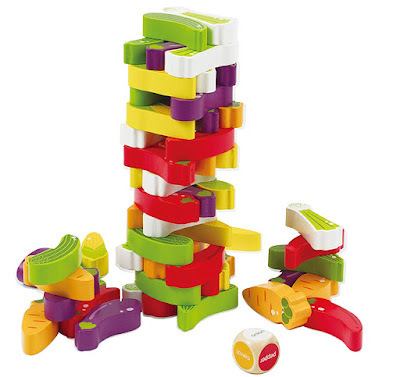 This pull toy simply consists of colourful shapes with the shape sorter. The string is long enough for every size of toddlers. 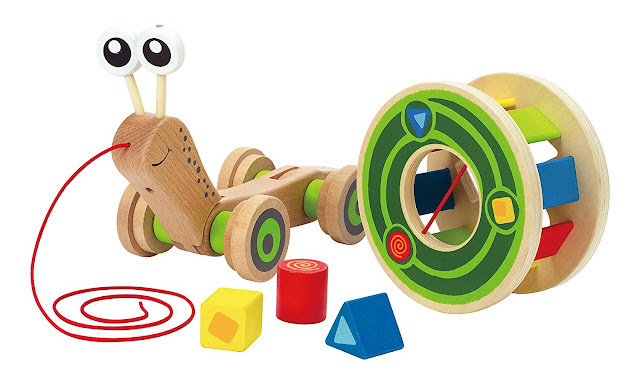 The child learns many things like shapes, colours and other motor skills through this walk along snail toy. The snail cell many times does not stay on base when rolling but it encourages the child to manage rolling speed. May few parents feel shape blocks makes noise in Snail cell while rolling. Shumee Activity triangle 5 sided multi-activity toy with an abacus, alphabet swivel blocks with pictures, chalkboard, clock, and wooden gears. Stimulates mental ability and fine motor skills. Eco-friendly wooden toy painted with non-toxic colours making it child safe. Suitable for 2 years plus kids. It seems no cons ( if you feel any drawback in this toy, mention in our comment section below). Hape is known for well designed best and innovative products for children. This is a sturdy basswood guitar is the perfect sing along instrument. 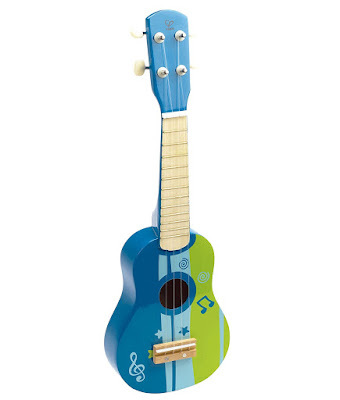 This Guitar is ideal for children above 3 years, made from non-toxic colours and child-safe material. This encourages individual creativity as well as family bonding. The toy is very well designed; it looks like an original puppy with a sleek and colourful body. The toy made with premium wood finished with child safe and non-toxic materials. The 4 wheels of the puppy rimmed with rubber for frictionless movement on any surface and also minimize the noise as well as helps in preventing scratches on the floor. 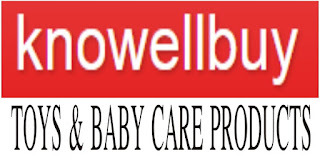 Helps in motor skills development. Some parents may feel this toy lacks educational aspects. The toy comes with 54 solid wooden veggies. It, not easy stacking as you think. 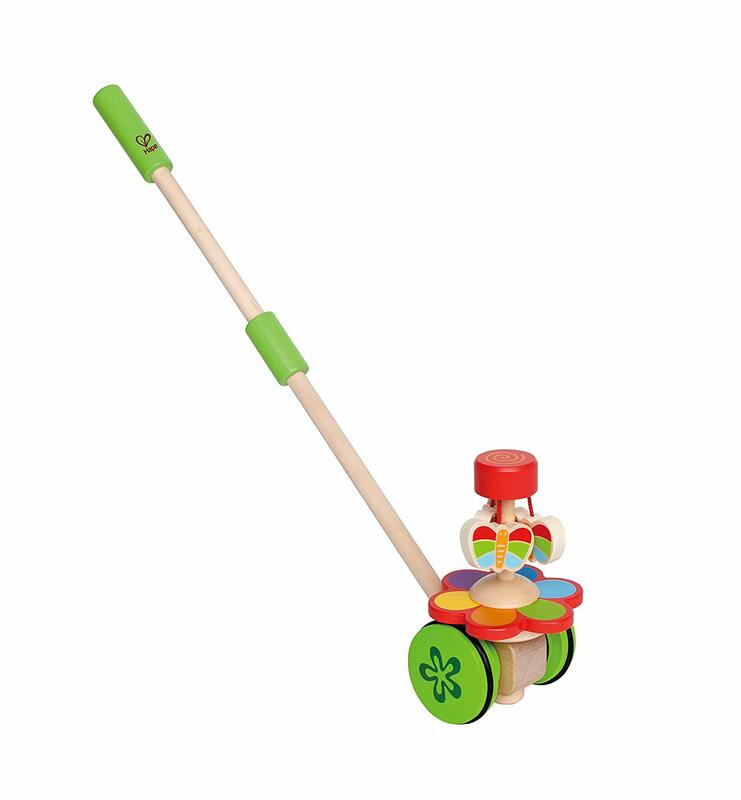 The toy promotes fine motor skills and encourages creativity. The Hape toys comply with the highest quality standards. The toys made with non-toxic and child-safe material. Supports from 3 to 8 years old kids. This Hape Wooden Dancing Butterfly is a colourful classic version of push toy. It will give hours of fun with butterflies circling a flower blossom. Develops kids gross motor skills. 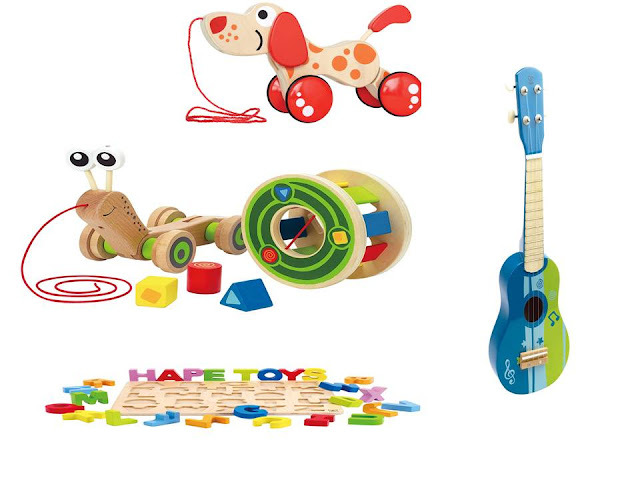 Hape Toys are made with quality wood and child-safe non-toxic colours. This Hape Wonder Rainbow Push and Pull Walker come with movable knobs, gear, and colorful balls. Rubber-trimmed wheel for perfect floor grip. This is perfect for 1 to 3 years old kids they can learn a lot during playing with it. Supports age 12 months to 3 years old. Assembly required by the adult.